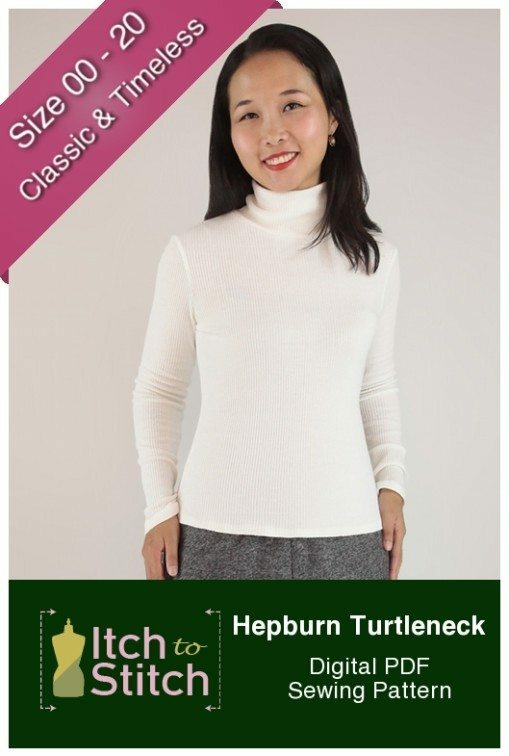 Here is my Hepburn turtleneck jumper by Itch to Stitch. It’s a PDF download with 31 pages of pattern to lay out. However, not only can you limit the printing to your own pattern size requirements, but having chosen to print the long sleeved version, I could actually fit all of the pages onto my table to trace. Usually there are pages hanging over the edge with PDF patterns. I bought the fabric from Girl Charlee back in June or July, in the sale. I don’t generally keep much of a fabric stash, other than left over bits, so I was well aware that this was in a cupboard waiting for an idea. Usually I am pattern lead; not fabric lead. As you can imagine, pattern matching was potentially a challenge, so I wanted a pattern with a large expanse of fabric that didn’t need matching, and yet something new. 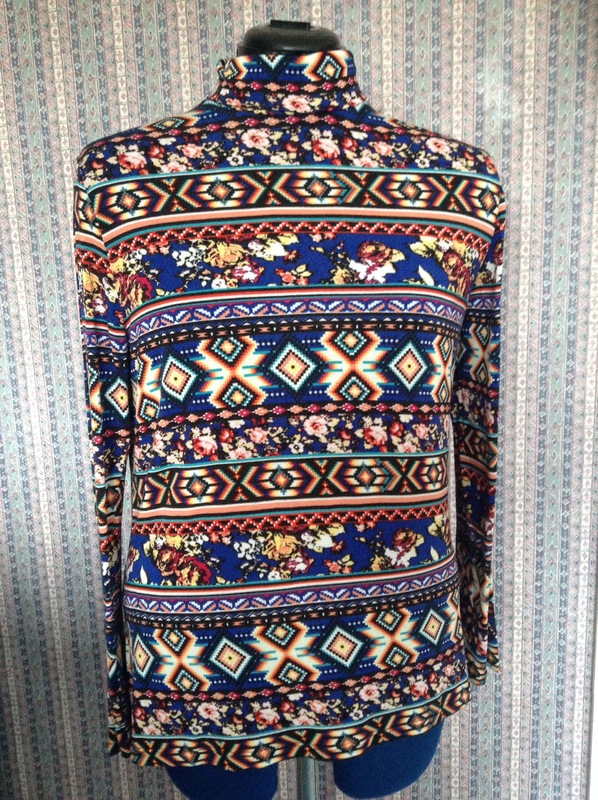 Although I have lots of long sleeved t-shirt patterns, none of them have a turtleneck. I could probably have adapted a pattern; buying a new one was rather lazy of me. So I went onto The Foldline again, this time searching for a roll necked jumper. There aren’t many that fit the bill. Some of those that do exist, claimed to be quite tight fitting, and not being a perfectly slim shape, I was wary of anything with too much negative ease. I’m pretty pleased with the grading that I did on this one. It is what I would describe as ‘loose enough’. The biggest problem, and possibly the single aspect of making it that took longer than anything else, was getting the fabric prepared to cut out. It was obvious when it is off the grain as the pattern didn’t line up. And when the pattern was lined up, the fabric went all twisty. The only solution was to cut in a single layer. I wish I had started out doing that! Even then, although the front and back views look almost exactly the same, they do not match down the side. I need to wear it in a way that that won’t show i.e. With a cardie, or under a pinafore type dress. I most probably will use the pattern again. It’s simple and straightforward and delivers a very wearable garment. But I will probably use plain fabric next time! The greater challenge is that I have just under 2 meters of the fabric left. At the moment I am thinking that I might make another Japanese jumper from the 2016 GBSB book. You have to cut the pieces in a single layer, and there is no way anything will match up, so I can be a tad less careful. Additionally, I have worn my first one far more than I expected to, so another one will go down well I think. This entry was posted on January 24, 2017 by ann hebden in Handmade, Hepburn turtleneck, Itch to Stitch, Jumpers, Sewing and tagged Fashion, Handmade, Hepburn turtleneck, Itch to Stitch, Jumper, Sewing.